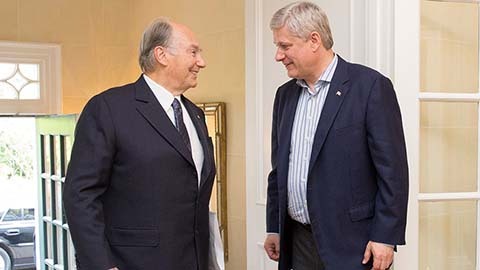 PM Harper, Aga Khan discuss threat posed by violent extremists 2015-05-27 | Ismaili.NET - Heritage F.I.E.L.D. Prime Minister Stephen Harper expressed his condolences to the Aga Khan Tuesday for the recent terrorist attack on the Ismaili community in Pakistan. The spiritual leader was visiting Canada for the inauguration of the Aga Khan Park in Toronto and attend meetings in Ottawa for updates on the activities of the Aga Khan Development Network in Canada. “It was an honour to once again welcome His Highness the Aga Khan to Canada and to renew our longstanding friendship. We both deplore the atrocities being perpetrated by violent extremists against religious and cultural minorities. Canada, along with its allies, will continue to actively support and defend human rights and freedom from persecution,” Harper said in a news release. The two leaders discussed the threat posed by violent extremists and their persecution and murder of religious and ethnic minorities. They also spoke about efforts to increase support for international development around the world, including improving maternal, newborn and child health. The Prime Minister reiterated Canada’s commitment to continuing to work with the Aga Khan on areas of mutual interest, including through partnership with the Aga Khan Foundation Canada. Prime Minister Harper last met with His Highness the Aga Khan in September 2014 during a ceremony marking the official opening of the Ismaili Centre and the Aga KhanMuseum in Toronto, Ontario. The Aga Khan is the 49th hereditary Imam of the world’s Shia Ismaili Muslims. There are more than 100,000 Ismaili Muslims in Canada. The Aga Khan was formally granted honorary citizenship in May 2010 during an official visit to Canada. In February 2014, the Aga Khan became the first faith leader to address the Joint Session of Canada’s Parliament. The Government of Canada and the Aga Khan Foundation Canada cooperate in development projects around the world, including in Afghanistan, Pakistan and Eastern Africa. Collaboration has been particularly strong on promoting maternal, newborn and child health – one of Canada’s top development priorities – including in Afghanistan, Mali, Mozambique, Pakistan and Tanzania. Established in 1980, the Aga Khan Foundation Canada is a registered Canadian charity and an agency of the worldwide Aga Khan Development Network, a group of development agencies with individual mandates that address social, economic and cultural dimensions of development. Active in 30 countries, these agencies share a mission to improve living conditions and opportunities for the poor, without regard to their faith, origin or gender. Our longstanding development partnership was evidenced in May 2014, as the Aga Khan attended Prime Minister Harper’s Saving Every Woman Every Child Summit in Toronto, where His Highness made a keynote address. As one of the largest country donors to the humanitarian crises in both Iraq and Syria, Canada’s assistance is helping to provide food, clean water, shelter, sanitation and hygiene services, medical and relief supplies; protecting victims of sexual and gender-based violence; and improving access to educational opportunities for children in conflict-affected areas.